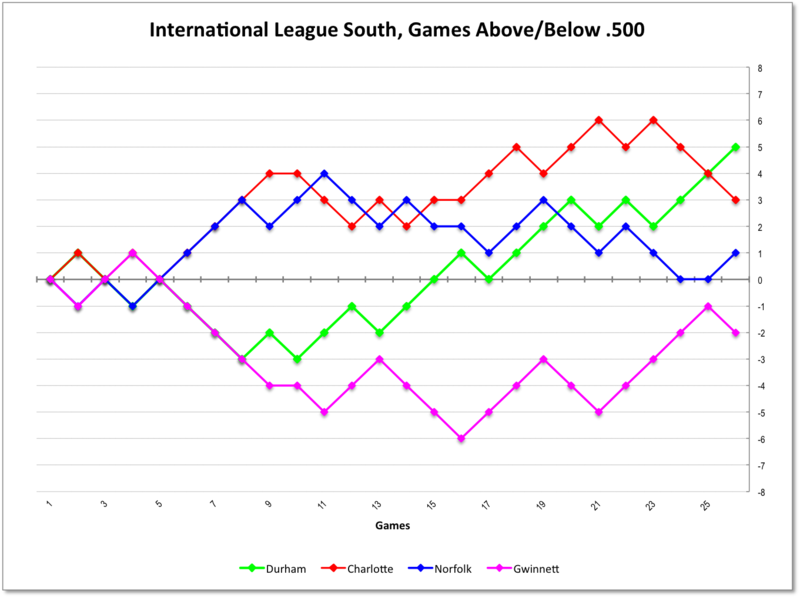 The Durham Bulls took over first place in the International League South Division with the win (and the Charlotte Knight's loss). This last week has been very pretty for the Bulls and their fans. Last night we saw Dylan Floro do his thing, pitching a scoreless 6 innings giving up only 4 hits and no walks. We have to feel some sympathy for catcher Luke Maile as he began dealing with veteran (37 year-old) Grant Balfour. 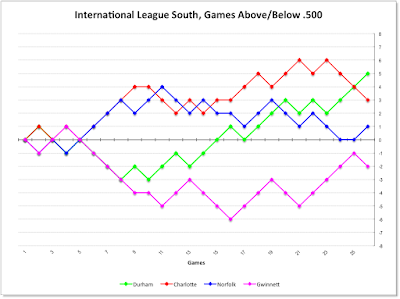 Balfour loves to spike pitches into the dirt and in his first Bulls appearance he did quite a bit of that. Nevertheless, Maile handled all but one of them, Balfour got two K’s, and the Bison’s stranded thier guy on 2B. We’d guess that Mikie Mahtook was disappointed when Joey Butler was called up to the Rays after Desmond Jennings went on the DL. From a Bulls fan’s perspective, however, he is getting much more playing time and pumping up his numbers. In our view he should stick with the Bulls until the Rays are ready to put him to work full time. He faced big leaguer Daniel Norris of the Bisons and got an RBI single and a nice double off of him. Nick Franklin showed off his major leaguer status in his long trousers and big leaguer’s “TB” batting helmet (didn’t notice that earlier). It’ll probably take a few more concussions before the big guys opt for something less attractive than what they’ve got. Ego is really something to see. Batting DH, Franklin drew two BB's, but he did appear to tweak something in his last AB. Hope not serious. Sorry to say that the infield looks even worse. Hope that some sort of magic happens as the year goes on. But it hasn’t happened yet. Bark in the Park last night. Fun to stroll through that area as we came into the park last night. Matt Andriese gets his first start as a 2015 Durham Bull at the 11:00 Education Day game today.